Strengthen your teams relationships & book a corporate surf retreat! Nancy Emerson School of Surfing will help building the bonding of your company with surf lessons in in Hawaii or on the Gold Coast of Australia. Aloha Surf Clinics on Maui and Nancy Emerson School of Surfing on Oahu offer corporate team building events that foster stronger team morale and strengthen relationships among co-workers. The learn-to-surf experience is an equalizer, and helps build stronger, more focused corporate teams. These events are powerful training programs to create lasting and sustainable change. Nancy and her team will make a real improvement to your company in an Aloha Spirit that is entertaining, relaxed, informative and professional. Everything is demonstrated clearly on the beach before entering the water. Nancy Emerson’s team will also support you in the ocean in a completely safe, fun and supervised way. Catch a wave of inspiration in your next team building surfing lessons event. 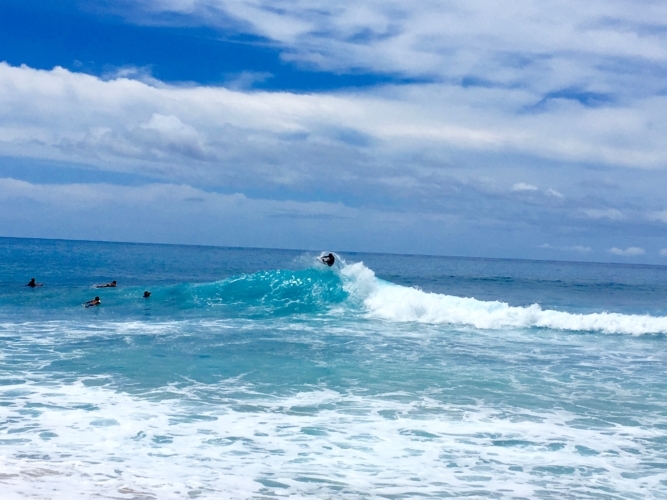 Aloha Surf Clinics with Nancy on Maui and Nancy Emerson School of Surfing on Oahu will help building the bonding of your company at Nancy’s two locations in Hawaii or bring Nancy and her Team to you! Nancy Emerson Surf Clinics offers corporate team building events that foster stronger team morale and strengthen relationships among co-workers. The learn-to-surf experience is an equalizer, and helps build stronger, more focused corporate teams. These events are powerful training programs to create lasting and sustainable change. Kiefer Sutherland, star of ABC's Emmy-award winning "24"
Let Nancy Emerson and her certified surf instructors add value to your next corporate team building event in an Aloha Spirit. • Creates an atmosphere that is entertaining, relaxed, informative, and professional and allows any stress to disappear. • Enhances relationships between co-workers through mutual dependency for outcomes and personal achievement during an activity that is challenging and enjoyable. • Puts co-workers on the same level where chain of command, in a formal sense, becomes irrelevant. • Lets co-workers see their peers learning and improving in a new endeavor where individuals can assist the learning of the whole team through coaching and mentoring for growth and development. • Gives people a chance to interact at the beach and in the ocean so co-workers observe each other in different surroundings. • Observe how collectively the team becomes stronger through working together. The more relaxed you are at work, the more productive and creative you will be. It’s a chance for teammates to let their guard down, just be themselves and have fun, which is great for strengthening relationships between co-workers. The ocean can help you uncover your true strengths and areas you can improve on in your life. Team building activities are integral to our business. We all know the benefits of increased productivity and the development of more open communication channels, but in 2005 I was challenged by my staff to find a fresh, creative, and stimulating avenue for our annual team building activity. Nancy Emerson’s Corporate Surfing Clinic provided the angle I was looking for. Learning to surf was the ultimate leveler, providing a fun, relaxed and educational environment that also offered a skill for life – ocean awareness. My staff have requested (for the first time) to repeat Nancy’s clinic in 2006. I would definitely encourage other organizations to choose this as a team building activity because I know how much they would benefit from it. “I attended my company’s sales conference in Hawaii, back in 1996. 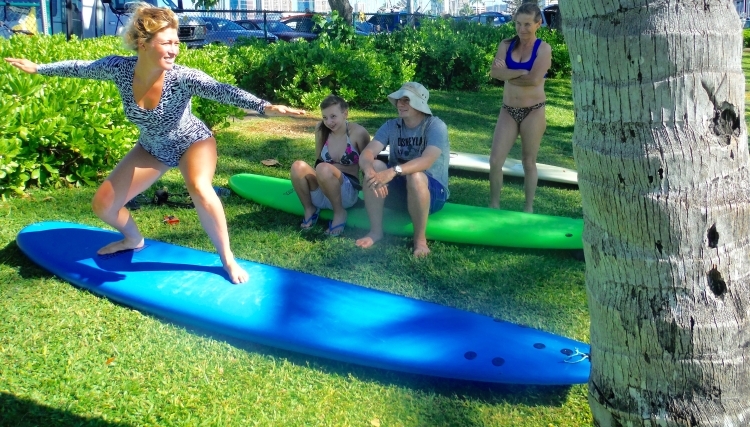 As a team-building event, Nancy and her staff conducted a surf clinic for those who were interested. “Nancy and her team of instructors were professional, informative and experienced surfers. They taught us proper techniques and stressed safety, but at the same time, made it a very enjoyable experience, especially for those of us who have never been on a surfboard. International professional surfing champion, Nancy Emerson was born and raised in California and Hawaii and has corporate experience working for Warner Bros, Disney, Sony and Universal Studios, to name a few. Nancy’s passion is sharing her knowledge of the ocean and surfing to empower others to achieve what they want in life. A natural at improvisation, Nancy colors surfing activities with her native language to give people a taste of authentic Hawaiian surfing language.